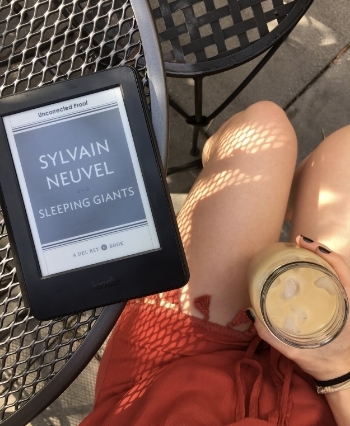 Sleeping Giants is a debut novel of Sylvan Neuvel. The first book of Themis Files series. that will hit the shelves on April 2016. It is described as in between WWZ and the Martian but, since I haven't read any of them I would compare this book with what I know better. This is a mix between X-files and Fringe tv shows. How cool is that? What first caught me was the cover, simple and captivating with this beautiful turquoise colored square with that strange symbol in the middle. Sleeping Giants is a mix of sci-fi and fantasy with political involvement, a mad scientist, mythology and lots of conspiracy. It talks about a metal buried relic of a humanoid giant statue carved with symbols , whose body parts are scattered through the world for unknown reasons by some sort of technological advanced race. The little girl who found the first part, a carved turquoise-glowing hand, is Rose Frankling, the same woman that seventeen years later lead the top-secret, and incredibly expensive, project to unveil the mystery behind the ancient hand . What it is? Who left it here? What those simbols mean? Together with Dr Frankling we also follow the story of Kara, a US troubled, beautiful and talented pilot and Vincent, a young and brilliant Canadian linguist. The storytelling is captivating . The story is told through transcripts, interviews and journal reports made mostly by a mysterious man, of who we don't even know the name. He seems to knows everything, everybody and clearly set the rules of this crazy project. Each event is told after it happens, by someone directly involved with it , during the recorded interviews with the nameless man, who seems to make the very same questions that comes to my mind while reading. I never read anything like that but I have to admit I really like it because in this way we have all the action/cause/consequences explained in a clear and objective way. To be honest I had a little bit of problem to get involved in the story, because the middle part of the book is kind of boring. The research seems stuck and there are few or none new discoveries, and only personal events are told. My attention drop everytime a love story is involved. This one I reckon is pretty ugly, but is just a matter of personal taste. I didn't like that, it seems out of place.I keep loosing interest in the story after few pages every time. But then, I reach the last part and I have to say, the story suddenly became a page turner, tense and gripping and it took me only a couple of hours to finish a book that I started 3 weeks before. We finally discover more about the robot and, let me tell you, it will blow your mind because I ended believing this is totally possible to happen. At the end, when everything seems settled and , kind of disappointing for me, something unbelievable and unexpected happens and then...the book is over and you realize Sleeping Giants will be out on April 2016 and I have no idea of how long it will take the second to come. All in all, this book was a original and fascinating one, I would definitelly looking after the sequel. Thanks for the ARC Random House !